The most common transactions include bonus issues, right issues and share splits. Both Bonus and Rights Issues involve new shares being allotted to some or all of the existing shareholders in proportion to their share holdings. In a rights issue the allotment is provisional until the shareholder accepts that they will pay for the shares. An example of a share split in the UK is when one 100 pence ordinary share may be split into five 20 pence ordinary shares. Please note that when dealing with UK share reorganisations, any shares purchased on or before 5th of April 1998 and sold prior to 5th April 2008 are subject to indexation allowance (relief). TimeToTrade's portfolio tools include a Share Reorganisation wizard to make managing your share portfolio simple. TimeToTrade will even make the necessary adjustments to your base cost for Capital Gains Tax calculations. After clicking on the 'share reorganisation' button, you will be presented with the following screen. 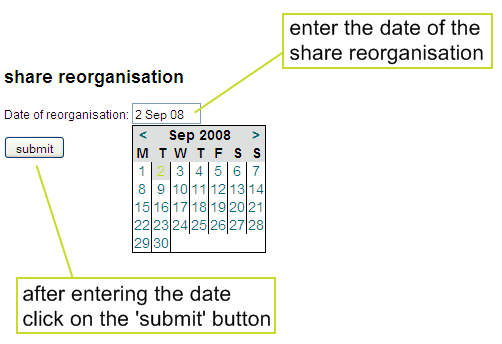 Enter the date that the share reorganisation occurred using the drop down calendar or by manually typing the date. When you have entered the date, click on the submit button. fractional shares = if you received a fraction of a share after the share reorganisation, then use the drop down menu to select 'YES'. Typically in the UK fractional shares are not issued therefore the default 'NO' setting should be used, as in NO fractional shares where received. Fractional shares are more commonly associated with overseas investments and UK Unit Trust and OEICs reorganisations. issue price = this field is used to capture the value of the share if there is for example a Rights Issue or if more than one class of share is involved in the share reorganisation. Please note that the value entered must be in Pounds, Euro, Dollars etc and not in pence for UK stocks. cash received = Enter any fractional, small or large cash payment received. TimeToTrade provides full UK Taxation support for fractional, small and large cash payments received as part of a share reorganisations. Please note that the value entered must be in Pounds, Euro, Dollars etc and not in pence for UK stocks. In this example we are going to assume that there has been a Capital Reorganisation of Carphone Warehouse shares. Let us assume that there is a 7:9 share consolidation of existing CPW.L shares and one class B share issued (i.e. CPW_B.L) for every ordinary share you owned before the share reorganisation. As a second class of share is issued, the price of the shares on the date of the share reorganisation is required in order to apportion cost between the two classes of shares. Let us assume that the CPW.L shares were valued at £3.00 and the CPW_B.L shares were valued at £1.25 on the day of the share reorganisation. If this example wasn't complicated enough, we will add in a fractional share payment of £2.50 received as a result of the 7:9 consolidation or the CPW.L ordinary shares. Click on the return to ledgers link to view the share reorganisation transactions in your ledgers.